Bubbleator (Android) - Live wallpaper shows important messages ~ Android Forever! Want to see your Facebook news feed, Twitter posts, missed calls, texts and upcoming events on your homescreen? 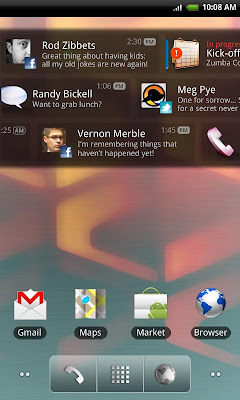 This live wallpaper brings into view the things you care about in an attractive interface, letting you view, open or remove notifications with the tap of a finger. Bubbleator Live Wallpaper is FREE on the Android Market!